Anna Karenina is a delightful explosion of colour, romance and tragedy that does credit to director Joe Wright. Its theatrical set changes, dazzling costumes and non-stop emotional high reeling are breath-taking. Whilst it is based on the well-known novel by Tolstoy, it constantly reminded me of the exuberant filmmaking style of Baz Luhrmann films Moulin Rouge and Strictly Ballroom. Director Joe Wright has chosen to film almost the entire film in a theatre rather that on the exotic foreign locations called for by the plot. Sets change before your eyes, horses race across a stage and a snowy steam train crashes through the indoor set. This is a bold and unique decision on Wright’s part. Set in high society 19th century Russia, the plot revolves around Anna Karenina (Knightly) who, married to a man she doesn’t love (Law), enters into an adulterous affair with a young count. Anna is beautiful and powerful and her actions change the course of her life and affect all those close to her. I must admit to being a bit dubious about Keira Knightly playing this role at first – this for all the same reasons that she is usually criticised including her constant pout. I am pleased to have been proved wrong. Knightly portrays Anna’s journey from young wife and mother to tormented, paranoid depressive with such poignancy that I found myself being unwittingly drawn in by her. Both Knightly and Law seamlessly flit back and forth between protagonist and antagonist, leaving the audience in as much emotional turmoil as I imagine Tolstoy intended when he wrote this epic on the terrible consequences of unfaithfulness in marriage. It must be said that Matthew MacFadyen, gives a superbly comedic performance of Oblonsky, the brother of Anna. He too, is mixed up in numerous adulterous relationships. The film and indeed the novel depict a 19th Century Russia overflowing with opulence and frivolity, yet sick with duplicity and degradation. The characters are the authors of their own terrible fates and yet Wright’s direction and the brilliant performances allow audiences to empathise with this human frailty. Anna Karenina is an intelligent film, which poses questions as relevant today as they were in Tolstoy’s lifetime. I would say this is a film well worth seeing. 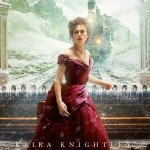 This entry was posted in Blog and tagged Anna Karenina, Joe Wright, Jude Law, Keira Knightly, Matthew MacFadyen, Romance. Bookmark the permalink.